Constructed to provide access from Interstate 80 to the Hennepin steel mill, Interstate 180 in Illinois is a 13-mile-long spur from I-80 south to Hennepin along the Illinois River. The freeway is lightly traveled, with 2015 IDOT traffic counts ranging from 2,050 vehicles per day (vpd) north of Illinois 26 to 3,550 vpd south of it. 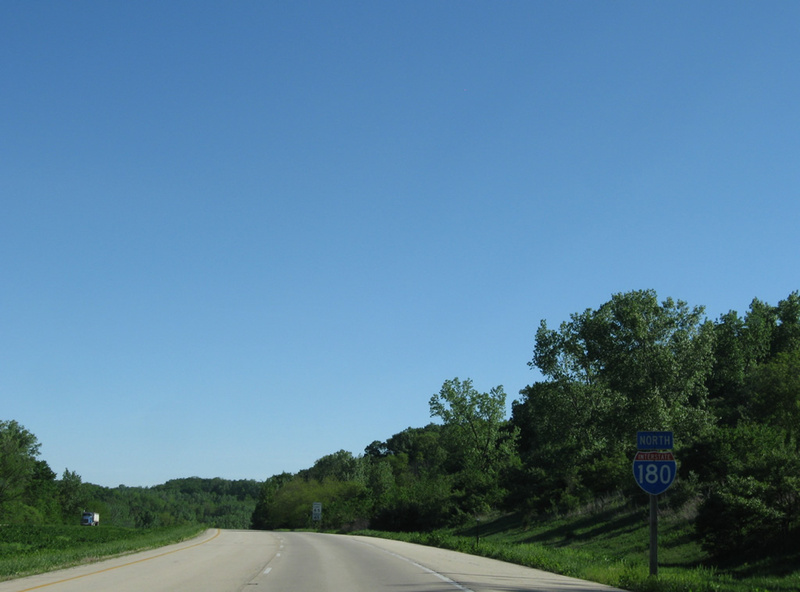 I-180 turns east at Illinois 29 to combine with Illinois 26 at Exit 12 and cross the Illinois River into Hennepin. The freeway end transitions traffic onto Illinois 71 at the village of around 750. While there are no immediate plans to extend Interstate 180 south from its current terminus in Hennepin, there were plans to widen Illinois 29 from the connector to I-180 south to the access road linking it with the Illinois 6 freeway (Peoria Ring Road) south from Mossville. Illinois 29 would bypass the communities of Chillicothe and Henry as an at-grade, four-lane expressway to connect the Interstate 80 corridor with Peoria. A vastly empty scene along Interstate 180 northbound after the interchange with Illinois 26. Photo taken 05/06/10. 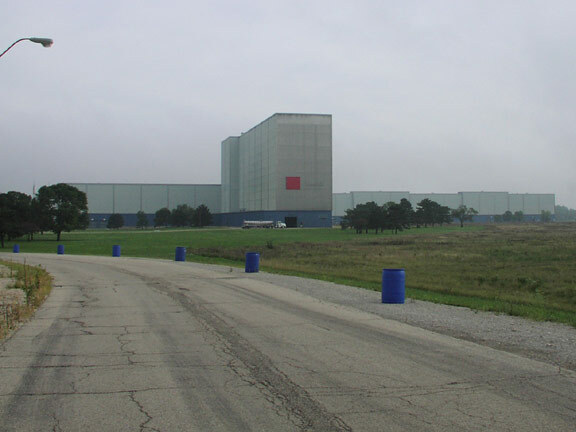 Approaching the Hennepin steel mill (operated at the time by LTV Hennepin Steel) along the access road extending north from I-180, IL 26 and IL 71. Photo taken by Don Hargraves (08/02). Interstate 180 leads due north from a diamond interchange with U.S. 6 for 1.5 miles to end at Interstate 80. Photo taken 06/21/15. Clearview font based guide signs replaced the succeeding overheads for Interstate 80 east to Joliet and west to the Quad Cities by 2010. Photo taken 06/21/15. Single lane ramps partition for Interstate 80. I-80 travels 66 miles east to the south Chicagoland suburb of Joliet. Davenport, Iowa, the largest of the Quad Cities, lies 68 miles to the west along the Mississippi River. Photo taken 06/21/15. A pair of end shields for Interstate 180 stand at the ramp separation for I-80. Photo taken 06/21/15. Former overheads for Interstate 80 posted along I-180 beyond the County Road 1650 north overpass in Selby township. Photo taken 09/04/05. These overheads were also carbon copied by 2010. I-80 continues east 14 miles from I-180 to Peru and west 4.5 miles to Princeton. Photo taken 09/04/05. Replaced end shield assembly for Interstate 180, posted within the freeway median. Photo taken by Jeff Morrison (07/03/07). One mile west of Interstate 180 on I-80 east. This stretch of Interstate 80 is rural in character and Exit 61 is the lone off-ramp along a 13.2 mile stretch between Princeton and Ladd. Photo taken 06/21/15. Bureau County 27 spans Interstate 80 a half mile ahead of Exit 61 for I-180 south. I-180 connects with U.S. 6 two miles to the south. U.S. 6 east combines with I-80 at the subsequent eastbound interchange along I-80. Photo taken 06/21/15. Exit 61 departs I-80 east for I-180 south. Interstate 180 connects with Illinois 29 to the north of Putnam. Illinois 29 travels from the rural community southward along the Illinois River to the city of Peoria. Photo taken 06/21/15. All guide signs for Interstate 180 on I-80 east were replaced to use Clearview font by 2009. Photo taken by Jim Teresco (07/01). Interstate 80 continues east from the north end of I-180 for 18 miles to meet Interstate 39 near La Salle. Photo taken by Kevin M. Clair (03/02). This ground level sign was the first for Exit 61 and Interstate 180 south. Photo taken 09/04/05. Former overheads posted one mile ahead of the trumpet interchange (Exit 61) with I-180 south. The control city for I-80 uses the Iowa capital city in place of Davenport, which is referenced for I-80 further east in the Chicago area. Photo taken by Michael Summa (1976). Continuing west from the crossing of East Bureau Creek toward the off-ramp (Exit 61) for I-180 south. Signs for I-180 also reference Peoria for the connection with Illinois 29 south through Henry and Chillicothe. Photo taken 09/04/05. Leading south from Interstate 80, IDOT recorded 3,000 vpd in 2015 along the initial stretch of I-180 toward U.S. 6 and the settlement of Coal Hollow. U.S. 6 heads west to the Bureau County seat of Princeton. Photo taken 09/04/05. Interstate 180 turns east at a three wye interchange with an unnumbered freeway spur, inventoried by IDOT as Federal Aid Primary Route 318, extending 2.2 miles south to Illinois 29. Illinois 29 passes under the freeway to the immediate east with no direct access as it travels south toward Putnam. Photo taken 05/09/10. Illinois 26 combines with I-180 southbound from a half diamond interchange at Big Bureau Creek. The tandem advance east across the Illinois River to the village of Hennepin. Photo taken 05/09/10. Rising to a height of 42 feet above the Illinois River, I-180 & IL 26 span the waterway across the Gudmund “Sonny” Jessen Bridge. The nondescript bridge totals 3,083 feet in length with a 65 foot deck accommodating four lanes of traffic with no shoulders.4 Photo taken 05/09/10. Lowering from the Illinois River, drivers along I-180 & IL 26 east enter Putnam County. IL 26 branches south in a half mile through rural reaches of east Hennepin. Photo taken 09/04/05. Power Plant Road passes over Interstate 180, one half mile ahead of the diamond interchange with Illinois 26 south and the transition to Illinois 71 east. Photo taken 05/09/10. South from I-180 and Hennepin, Illinois 26 follows the east banks of the Illinois River to Lacon and East Peoria. Photo taken 05/09/10. As Interstate 180 ends, Illinois 71 east to Mark, Granville and Cedar Point begins. The overpass brings Illinois 26 west onto I-180 north while also connecting with the entrance to the Hennepin steel plant site. Photo taken 05/09/10. Illinois 71 expands from a rural two-lane highway into a four-lane freeway (I-180) just beyond Coffee Creek. Photo taken by Matthew Salomone (07/20/06). Illinois 26 north ties into the west end of Illinois 71, 18 miles north from the city of Lacon. High Street (former Illinois 26) stems west from the state route nearby to the Hennepin village center. Photo taken 09/04/05. Entering the diamond interchange with Illinois 26 south and the access road north to the former Hennepin steel mill. Photo taken 09/04/05. Illinois 71 concludes a 69-mile route from Oswego as Interstate 180 northbound begins. Photo taken 09/04/05. Illinois 26 combines with Interstate 180 west to span the Illinois River. IL 26 formerly crossed the river to the immediate south of the freeway, using what is now County Road 1050 North. Photo taken by Jeff Morrison (07/03/07). The entrance road to the former LTV Hennepin Steel Plant extended north from Illinois 26 and I-180. The bulk of the facility was demolished in June 2017. Photo taken by Don Hargraves (08/02). The first confirming marker for I-180 north precedes the Power Plant Road overpass. Illinois 26 combines with I-180 west for 2.6 miles to Exit 12. The state route meets the freeway for a second time between Bureau Junction and Princeton. Photo taken by Jeff Morrison (07/03/07). “Illinois Schedules Its Largest Highway Building Program.” Chicago Tribune, February 16, 1969. “Shuttered Hennepin steel mill being demolished.” Journal Star (Peoria, IL), April 19, 2017. FAI 180 over Illinois River. BridgeReports.com. Page updated August 21, 2017.